We mumble covered a whole range of things. And in, you know, you can, you can guess them. I’m not gonna go down through that list. Yes, you can guess. Especially when the Premier who is not gonna go down that list, goes down that list. "This is a historic day for the Mi’kmaq of Newfoundland and Labrador. The Government of Newfoundland and Labrador has long been a proud supporter and advocate of this process," said Minister Pottle, on the signing that took place at the Federation of Newfoundland Indians Museum in the community of St. George’s. "As an Aboriginal woman, I understand what this means to the membership of the Federation of Indians who have been waiting several decades for this acknowledgement from the Government of Canada. All of the Aboriginal peoples of Newfoundland and Labrador join the Mi’kmaq in celebrating this accomplishment." A question for the Minister, Mr. Speaker: In her opinion, are the Labrador Métis Nation one of "all the Aboriginal peoples of Newfoundland and Labrador"? A supplementary, Mr. Speaker: Why has the government of Newfoundland and Labrador been a "proud" supporter and advocate of the FNI process, and for "long" to boot, when that same government has actively worked to undermine the LMN? Once upon a time, not that long ago, Danny Williams drove up the Northern Peninsula, in a Winnebago or some other such suitable campaign vehicle, in the course of a couple of provincial by-elections. Out across the water, he saw lights twinkling on the far horizon. No, someone patiently explained to him. As well, from a Lower Churchill perspective, the federal government are looking at several billions of dollars in green infrastructure money. Well, what better place to put some green infrastructure in transporting some of that Lower Churchill power to the Island of Newfoundland and Labrador, in order to replace Seal Cove, Holyrood, thermal generation? But apparently O.D.P. hasn’t read and initialed his own “re-branding” memo. Surely it’s the Island of NewfoundlandLabrador, no? Labels: pretty maps, what island? That’s a good project, that’s an annuity, that’s a license to print money, that’s why we’re gonna do it alone, and that’s why we want to have the big piece of the action. (Mumble mumble) gonna say alone, we gonna do it in partnership with the you know. No, Mad Rock, we don’t know. What or who bes the “you know” who gonna help we do it alone? Hey, Danny! Some equity is coming onto the market! Here's your chance to prove Brian Peckford wrong about your concern for the fishery! Danny isn't an autarch. He's a monarch. It was one thing to hear Our Dear Premier's designated attack poodles, freshly armed with nasty talking points, take on British Columbian Brian Peckford the other morning, especially in light of O.D.P. 's known history of spirited defence of Mr. Peckford's legacy and reputation. Premier Danny Williams suggests that former premiers should “shut up and go away” once they leave office, and not criticize incumbent governments. “I find it sad when former premiers comment on current administrations,” Williams said. “I pray to God that I never do that when I finish politics. He said he tries not to comment on the actions of previous administrations, and won’t critique his successor whenever he leaves office. “Hopefully, I can live up to what I’ve said, and when I get out of politics, then I’ll shut up and go away,” Williams said. Interesting... Former Premiers, O.D.P. say, should "move on", especially, according to the attack poodles, if they "live out there", or if they are "not a resident of Newfoundland and Labrador". So by those standards, what makes it acceptable for Danny Williams to inject himself into the provincial politics of Quebec? "The more we can spread out our energy supply means that we won't be totally dependent on Quebec for energy — which, given the volatility of politics in Quebec, could be a very, very sensitive situation in years to come," Williams warned. "Obviously [he] and Stephen Harper are very, very close," Williams said. "He hitched his wagon to Stephen Harper's horse during the New Brunswick election, and you know where that got him." "The bottom line is that Nova Scotians have basically said yes to less," Williams told reporters Wednesday, after Harper and MacDonald made a joint announcement in Ottawa. "[The feds] haven't lived up to the promise. In fact, they've gotten Rodney MacDonald to take less, and, you know, Stephen Harper has a way of preying on the weak," Williams said. Williams said he expects Saskatchewan to continue its role in the federal fray. "I would certainly think that the new premier (Wall) in Saskatchewan would have to take up the equalization fight. The kind of dollars that Saskatchewan (is) losing because of that promise are huge." "You know, to live out there and then come in here and tell us we're doing it all wrong is a bit much," one current Tory cabinet minister told the former Tory premier. "Well I must remind you that actually Brian Peckford is not in government number one, number two is that he's not a resident of Newfoundland and Labrador," said another. Danny himself finds "it sad when former premiers comment on current administrations..."
But current Premiers are, it would seem, allowed to comment on current administrations, in provinces where they are not resident. Are there any rules, even his own, that Danny doesn't think he's above? In the space of just over two hours late this afternoon, another 3000 "votes" were registered in the VOCM Question of the Day. Do you agree with Premier Danny Williams that it is not the place of former premiers to comment on how the current government operates? The tally at this hour, with 8318 "votes" in, is 77% agree with the Premier, 22% do not, and 2% are unsure. Yesterday's question was "Should the provincial government revisit the Sunday shopping issue as they are doing in PEI?" It garnered 1647 responses. Mondays? "Should there be a full inquiry into the provincial health system in light of the incident involving confidential patient files?" 1437 responses. Sunday's was "Should cooks who work at provincial government run facilities be recognized as skilled trades professionals?" 2078. Friday's, which was open to voting all weekend? "Do you think the provincial government should increase revenues going to municipalities?" 1330. Important questions all. But a pointed question about Our Dear Premier, and the turnout, for one day, tops the "voter turnout" for six days' worth of QotD. And, crunching the number in the vote change from early this afternoon, it means that that when those 3000 new "votes" were cast, at a rate of one every two seconds, a whopping 85% of them were made, by some staggering coincidence, in favour of the very position that the Premier himself would likely take, if he had the time to worry about such trifling things. But of course, as a busy, busy man, who spent last week in Brazil working very hard on behalf of His people — he knows what he's fighting for, and apparently that's an aluminum smelter — he doesn't have that time. It's truly amazing how very quickly the "votes" can be registered on the VOCM Question of the Day — at one point this afternoon, at the rate of nearly 5 per second. Click. Clear cookies. Refresh. Repeat. That's the drill, innit? In the space of about 20 minutes, about 1600 votes were added to the already-high vote total. Of course, whenever the subject is near to Our Dear Premier's big, warm, fuzzy heart, the votes spike for some reason. Funny that. Which makes it triply funny that. Not only that there are so many votes. Especially that there should be such a mismatch between the "votes" and the comments, both on-line and on-air, which were harshly, and often hilariously, critical of O.D.P. MR. WILLIAMS: The least you could do is show some respect for two former premiers of this Province. PREMIER GRIMES: Well, there was a premier for forty-one days or so in between who was a Conservative, but the last Conservative one who was here bragging about the fact that: I am a fighter. I went to court on the Upper Churchill. I went to court on the offshore. Sure he did, and guess what he did both times? Lost. Because he was more interested, Mr. Speaker, in trying to pretend and wanting to pretend and falsely making the people of the Province believe that he would rather fight for them rather than do something to develop the Province. As a matter of fact, the truth in the offshore is this: what we are doing now is celebrating twenty-five years with NOIA and five years of oil, yesterday, is ten years delayed because the Premier wore a black armband and went to court rather than do something about developing the offshore when it could have been done ten years ago. PREMIER GRIMES: That is the reality of it. That is the fact, Mr. Speaker. That is what is happening in Newfoundland and Labrador, and the former premier - former, former, former premier - who sits over there knows it because he was with the group and he is saying nothing today because he knows it is true. MR. WILLIAMS: How dare this Premier, of all people, impute the motives of someone like Brian Peckford, a passionate Newfoundlander! Premier Danny Williams says the security breach at the Provincial Health Laboratory was an unfortunate lapse in judgement, but it is not a health care issue. 35 people will be notified in the coming days that some of their sensitive health information, including their names and MCP numbers were available online during the breach. Williams says it was an information technology issue and they are dealing with it as such. A spokesperson with the Office of the Official Opposition says the RNC has been called in to investigate after someone allegedly tampered with their computer system at Confederation Building. The spokesperson says government I-T specialists allegedly traced the source of the tampering to a computer in the Government Members Office. The spokesperson would not reveal the nature of the tampering. A spokesperson for the Premier's Office says senior officials are looking into the matter and they have no comment at this time. St. John's - Opposition Leader Danny Williams is asking police to expand their investigation of a possible break-in of his party's computer system. Government computer experts confirmed Thursday that someone had tried to hack into the Tories' computers. The attempt was traced to a Liberal staffer in the government members' offices. Williams said since then, Tory staffers have told him they suspected similar attempts had been made in the past, but that they hadn't given them much thought at the time. The Opposition Leader said as a precaution, he's now having all his offices checked. "We would do sweeps to make sure that there's no monitoring devices in our offices...we're doing everything we can to make sure we're tight as a drum in that office," Williams said. The Royal Newfoundland Constabulary won't comment, except to say it has computer experts working on the case. FRED HUTTON: We begin our news tonight with word that no charges will be laid in connection with an investigation into complaints by the Opposition that someone in a government member's office tried to hack in to the Conservatives' computer system. The Opposition filed the complaint two weeks ago. This afternoon, the RNC concluded that, while the government and Opposition share the same system and someone using a computer from the Liberal offices did make several attempts to use the Progressive Conservative printer, no criminal charges will be laid in connection with the incident. SGT. BOB GARLAND (ROYAL NEWFOUNDLAND CONSTABULARY): The computer in question had been left unattended so we were unsure who indeed was at that computer at the time that some information was sent to the printer, but indeed there were no criminal breaches, there were no breaches of protocol, and the investigation is concluded. No charges will be laid. HUTTON: Opposition leader Danny Williams had this initial response. DANNY WILLIAMS: Well, I'm satisfied with the process that the police have gone through. With regard to the outcome, I'm very, very concerned. I mean, we had legitimate concerns. As I said, there were just too many coincidences. You know, another contact that was made with one of our computers was Loyola Sullivan's at the time that the Auditor General's story was breaking. So, you know, we had legitimate concerns. And I think what we've done is we've nipped it in the bud. We've got it before it really got into something really serious. What has to happen, though, is that there has to be a whole revamping of the system. The government I.T. department has to really look at how it's handling things. We're all on one server. You know, equipment is being shared throughout the building, and it's just, you know, an unacceptable system that's in place right now. HUTTON: Mr. Williams says the entire incident is unsettling and, as a result, Opposition members are on alert. WILLIAMS: Everybody is very, very nervous about it, especially on the basis that there's a lot of confidential, a lot of strategic, information that's contained within our offices. And the Premier made an attempt to sort of laugh this off and talk about spy novels and everything else, but you know security is a part of operating political offices, particularly I'm sure the Premier has had it done himself in his own office; he's had it swept. So, you know, we're concerned. We're monitoring. We've hired security consultants to make sure that these things don't happen again. So we're not treating it lightly and I guess there's, you know, a lesson in it for government and for the I.T. division of government. The alleged hacking of an Opposition computer by a Liberal political staffer was actually an attempt to use a Tory printer, a two-week criminal investigation by the Royal Newfoundland Constabulary has concluded. “We went through the whole system, we looked at it and what we’re dealing with there in the final analysis is a printer,” said Sgt. Bob Garland, RNC media spokesman. He said the printer had been set to “share” by someone in the Tory office, which opened it up to others on the same network. MHA computers, regardless of party affiliation, are part of a single network. Investigators have concluded there is no evidence an attempt to access a Tory computer was made. They were unable to determine who attempted to access the printer, although the terminal in question was traced back to the government members’ office. “We have no idea who was doing it. (It was) someone from the Liberal offices, but whom we don’t know,” Garland said. The Conservatives knew the alleged attempt to hack into their computer system was a print-sharing problem before a television crew and police investigators arrived, says government’s information technology (IT) team, which conducted the original internal investigation. A staff member in the Tory office was told at 2:45 p.m., Feb. 7 — the same day the concern was raised and the RNC called in — that the incident related to print-sharing, which is software the Tories themselves requested, says Harry Hutchings, government’s director of information technology management. “We told them it was only print-sharing and that there was no threat but, regardless of that, they did take the action they did,” he said. A two-week criminal investigation by the RNC concluded no security breach occurred and the offending action was an attempt by a Liberal staffer to use a printer in the Tory office. Brian Crawley, director of communications for the Tories, confirmed at least two people in the office, including the chief of staff, were aware the IT division had traced the attempt to a printer that afternoon. But to them, he said, that fact is — and was — immaterial. “What we knew was that a political government employee was caught attempting to access our computer system,” Crawley said. Crawley said the RNC was called at 2:15 p.m. The opinion of the IT division was not communicated to Tory Leader Danny Williams because it was considered irrelevant, he said. Order of Newfoundland Recipients Announced, the Ministry of Truth reports. When will the Order of Labrador recipients be announced? The Williams Government recognizes the important role that immigrant women play in this province by providing grant funding to the Multi-Cultural Women’s Organization of Newfoundland and Labrador as well through [sic] the development of the $6 million Immigration Strategy, which includes the development of the Office of Immigration and Multiculturalism within the Department of Human Resources, Labour and Employment. Has the whole "Williams Government" thing been turned into some kind of bizarre Confederation Building drinking game? As I understand from media reports, Prime Minister Paul Martin promised Newfoundland and Labrador during the election campaign 100 per cent of offshore resource revenues. Now I understand there are conditions being attached to this commitment. Federal Liberals never supported the pro-provincial provisions in the Atlantic Accord but, of course, had to accept what is the law of Parliament of Canada and the law of Newfoundland and Labrador, agreed to and supported by the Mulroney administration. These actions by the federal Liberals are nothing new. Both former energy ministers, Marc LaLonde and Jean Chretien of the Trudeau administration, failed to deliver on statements made regarding this same issue years ago. On June 20 in a press release, I warned the province about accepting verbal assurances from any federal party, and particularly pointed out the abysmal record of the federal Liberals in earlier talks on the offshore issue. I urged the province to get a clear, written assurance. Given the recent history of clawback, long after the Atlantic Accord was the law, the federal Liberals are once again up to their old tricks. The three major political party leaders want to let Newfoundland and Labrador keep more of its resource revenues. Well it would seem elections are good for something. But hold on a minute! These are just verbal commitments - should I say promises. And we have seen many broken ones over the years and lately some really big ones in Ontario. 2. The Conservative Party is a new party and the leaders of the old PC party who supported the accord are no longer around. So some questions there. 3. The New Democrats have never formed the Federal Government so who knows with them. 1. Get in writing before election day , in clear, unambiguous language what each of the parties mean by the verbal promises they have made. 2. A commitment in writing that the changes once made, if they are really better, will be enshrined in legislation in Ottawa and St. John's and that Section 64 of the Accord will be honored - i.e. that if the province gets the requisite support among the other provinces for the constitutional entrenchment of the accord that it (government of Canada) would introduce a mutually agreeable resolution into Parliament. 3. And that this would include the fiscal measures now being promised which would involve all resource revenues . The problem is not the Atlantic Accord itself but rather the fiscal arrangements between the federal government and the province. The Atlantic Accord should not be re-opened. The province would do so at its peril. The risk that there would be a quid pro quo is too great with the probability of dilution to some of the important pro province provisions especially as it relates to management (Sections 21 to 32 and Section 33 (a) and revenue sharing (Sections 36 to 39 inclusive). Certain forces who are obviously against many of the pro-provincial provisions of the accord have cunningly persuaded many that the Accord is the problem. Some have already suggested the outrageous notion that the two offshore boards be combined - obvious dilution of provincial power would be inevitable. We must not put at risk the gains the province has already made. Remember the Supreme Court ruled the offshore federal, yet we have powers (management, revenue sharing and equalization offset) in the offshore through the accord that contradict this decision. If only in the Voisey's Bay Project (dare I also introduce Churchill Falls, iron ore , the fishery) where we had and have all the power, we were and would be so vigilant. The problem is the fiscal arrangements between the federal government and the provinces over the treatment of resource revenues in the overall - all resource revenues - the equalization formula, clawback and the overall federal power. We need to keep more of all our resource revenues through a new federal provincial arrangements agreement that is in legislation of both Parliaments and in the constitution so that it is beyond Federal unilateral change. We already have all the provincial powers and revenues under the Accord, i.e. principal beneficiary (some objective observers even say we may have more than if we had won in the Supreme Court), it is the retention of our revenues and will undoubtedly entail a countrywide agreement. Go after it - yes - but let's not be hoodwinked by those who are trying to find solutions in erroneous places and deny us, for one of the few times in our history, the recapture of a resource that was snatched from us. I read with interest your coverage of the federal fisheries minister and his cohorts suddenly holding press conferences about alleged illegal fishing on our continental shelf and the boarding of a number of Portuguese boats. Is this some sort of cruel joke? How many humiliations must the people of Newfoundland and Labrador endure from their federal government? Dropping any link between the Upper and Lower Churchill rivers is a disaster and belittles and demeans the enormity of the fiscal challenge the commission admitted the province is facing. Saying goodbye to somewhere between $500 million and $1 billion a year is irresponsible. Dropping the Upper Churchill and trying to squeeze more from the Atlantic Accord when the province has not enforced present provisions reeks of politics, not independent rational policy assessment. It was bad timing and a poor approach.Premier Roger Grimes is a desperate man.If, in fact, he was serious about joint jurisdiction of the fisheries, from a policy perspective he should have done this earlier and then the desperate political taint would have smelled just a little, and not a whole lot as is now the case. I had the agreement of all the provinces during the patriation process in the early 1980s for shared jurisdiction and the federal government said no.Where was the Liberal Party of Newfoundland then? The approach is wrong. 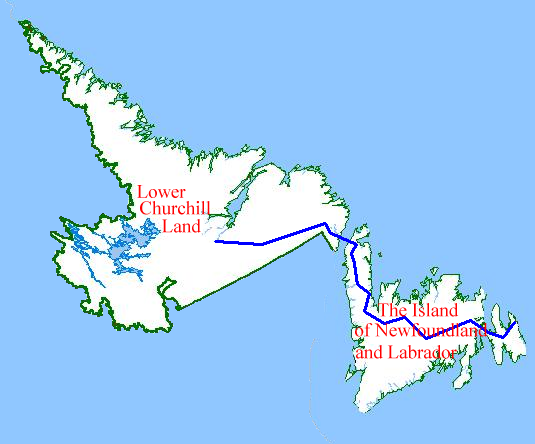 Grimes should know that this is just not a Terms of Union issue.It will require a constitutional change involving seven out of 10 provinces and 50 per cent of the population.If this was a serious propositionthe province would have prepared adetailed proposal and looked for allies,especially other coastal provinces. There should be a new shared arrangement regarding the management of the fishery. My book, The past in the present, outlines how the division of powers could be done but the timing and approach here smacks of political opportunism rather than innovative policy-making. Very convenient things for the former premier to be saying, what, with his successor in the leadership of his party in the middle of the pre-election campaign with the former Liberal government. Brian Peckford has never been known as shy. ...when they were in opposition. Only people "in government" are allowed to say anything about anything. Anyone else is just being negative. Non-constructive. Silly. Of course, Danny Williams and his enablers have never been terribly consistent in the application of the Shut-Up-And-Stay-Retired rule. As long as the retiree supports Our Dear Premier, or serves His purposes, or, at very least, doesn't contradict him, the retiree is useful. But if the retiree, or anyone else, contradict Him? Then they join the ranks of the Unpersons. Oh, to be a fly tonight on the wall of some of the old-stock Peckford Tories around Town. Not one, but two provincial cabinet ministers were designated today by the Eighth Floor to be "irked" on behalf of Our Dear Premier, who's probably still exhausted — that half-hour time change can be brutal on the system — from all that iron-ore industry fact-finding in Brazil, warm, sunny, tropical, sunny, bronzed Brazil, in November. Members of the Provincial government are reacting to statements made by former Premier Brian Peckford over the weekend. Peckford accused the government of being solely focused on oil and gas and neglecting the other resources. Finance Minister Tom Marshall told VOCM Open Line that it is clearly stated in the budget and in the speech from the throne that the non-renewable resources will not be around forever and the province needs to take advantage of this window of opportunity. Marshall says they are looking to transition into a more diversified economy which relies on renewable resources. Government Services Minister Kevin O'Brien told VOCM Open Line Peckford has taken a hard right turn on his postition after accepting a position with the Federal government. O'Brien says Peckford is not a resident of the province and he is not here to see the investments the province has made in the rural areas. You know who else is not a resident of the province, and thereby not able to see the investments that the province has made in the rural areas? The 10,000 or so of the 15,000 former residents of rural Newfoundland and Labrador who have not only permanently left their rural communities in the past four years, but who have left the province altogether. "Having people come on and make unpaid political broadsides is not my idea of good radio," said Comrade Rowe this afternoon on the Two-Hour Daily Hate. Paid political broadsides are much preferable. "Newly-elected Members of the House of Assembly will be sworn-in tomorrow"
The newly-elected Members will be sworn in. The newly sworn-in Members will then sit around until some time in 2008 before resuming their Parliamentary duties. A while back, someone on one of the VOCM phone-in shows made the claim that Newfoundland and Labrador has fewer people now than at Confederation in 1949. If you were listening that night, that sound you heard? yeah, that was a cringe. Danny Williams and the Progressive Conservative party won a majority government. We need opposition, regardless what party is in power. The PCs should never have taken five or six months off from opening the House. They are well paid. Furthermore, they should have a cutback on the number of members we have in the House, for there are far less people in Newfoundland and Labrador today than there was in 1949. The population of Newfoundland and Labrador, in the last pre-Confederation census in 1945, was 321,819. In the first post-Confederation census, it was 361,416. 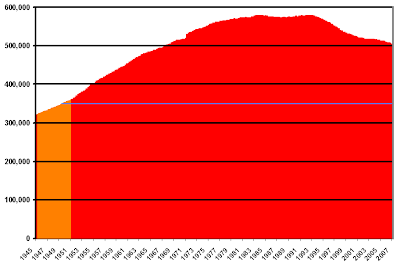 Interpolating, assuming, for argument's sake, a constant rate of population change in between, at the end of the first quarter of 1949 the population would have been 348,200 or so. The latest inter-censal population estimate is 506,275. It's about 12,000 fewer than when Danny Williams and the Progressive Conservative Danny Williams Government took office, about 62,000 fewer than the peak census population in 1991, and about 74,000 than the peak inter-censal population estimates recorded in 1984 and 1993. But it is still more than 150,000 more than the population was at Confederation. But it's too late. The myth has been born; nothing, certainly not boring ole facts, will kill it now. Well fiddle-dee-diddle-dee-diddle-dee-diddle-dee: over at The Telegram, Riosel Mac Oianghir isn't quite feeling the state-sanctioned Irishness. Another day, another Barb Sweet report in The Telegram regarding the future of the Colonial Building. "The historical significance of it from both the provincial and federal side should see that the federal government come in and be a partner with us on this," said Tourism Minister Clyde Jackman. Step by step, we are becoming masters of our own house... one federal government grant at a time. Apropos Planning of Ottawa and Dunbar Studios of St. John's were hired to come up with the presentation Making These Walls Talk, which calls for a hip interpretation of Colonial Building's history, combining new technology and interactive displays. Both reports were obtained by The Telegram through access to information legislation. The consultants' work cost a combined $200,000. Release to the public every government-commissioned report within 30 days of receiving it, indicate the action government will take on a report's recommendations within 60 days, and ensure prompt public access to all government reports in hard copy and on the Internet. What happened to that pledge, ODP? trade deals allowing the sale of Canadian goods to offer more catch to the foreign nations within our own waters. that was the beginning of the downfall of the fishery in Newfoundland and Labrador, and eastern Canada. WHO traded fish quotas to foreign countries? In exchange for WHAT trade or foreign policy considerations or concessions? WHEN did these deals occur? WHERE were they signed or otherwise approved, and by WHOM? HOW, that is, under authority of what domestic or international legal regime, was this fish-for-X practice carried on? This would be a great subject for one of the two media outlets in the province devoted to fisheries matters to investigate in detail. Or maybe even The Independent, given that it's so inependence —, er, independent-minded. Let's assume, for the sake of argument, that those "trade deals" were made. If that's the case, then each one of the questions above should have a factual and documented answer. Joan Forsey, her bio tells us, is "a Newfoundlander living in Toronto, is a former journalist who has been researching and writing about Canadian economic and political affairs for more than 30 years, including seven years as a writer on the staff of the late prime minister Pierre Trudeau." The federal government could, if it were serious about wanting to “lead,” facilitate the development of the lower Churchill’s clean, renewable energy and help make it available to those, like Ontario, seeking to protect the environment. But that would annoy Quebec. And for the federal government, winning House of Commons seats in Quebec is obviously more important than fighting climate change. Perhaps Ms. Forsey can call upon her research skills, or her more than 30 years writing about economic and political affairs, or, especially, her seven years in the Trudeau PMO to remind us all: when the Trudeau government introduced the Energy Security Act in 1981-82, how did Brian Peckford react? And how did René Lévesque? 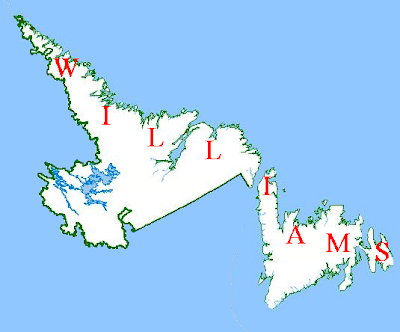 It's easy enough for Newfoundland nationalists to trot out the old canard, as Forsey does, about how "There are 75 federal seats in Quebec"; this, when compared with the seven seats in the House of Commons for Newfoundland and Labrador, is supposedly, the root of all Churchill Falls evils, or at least the favoured root-of-all-evils of convenience. So how did the political math go back in 1982? Oh, that there were still another Forsey with Newfoundland roots, a penchant for writing, and an appreciation of the power of truth over myth, around to join this fray. Another display would allow visitors to vote for or against Newfoundland’s independence, as if they were back in the day. “People would be presented with arguments pro and con and asked to vote. They would drop tokens into clear plastic tubes so that all could see the tally,” the report states. A low-tech version of the VOCM Question of the Day, in other words. Wonder how the upper floors of Confederation Building will engineer the stacking of that "tally"? And, in the interests of historical accuracy, instead of a plastic-tube simulation of the 1948 referendum, it ought to be a plastic-tube simulation of the Confederation Election of 1869, complete with a big, stern notice: Labrador Residents Do Not Have The Right To Vote. “No other province in Canada has a former legislature building that provides this sort of opportunity. No other place in the province is so central to Newfoundland and Labrador’s political heritage and identity,” the report says. That might well be because no other province in Canada has an extant former legislature building. On Friday, CBC Fisheries Broadcast host John Furlong read a long excerpt, three minutes or so, of an email from one Agnes Noseworthy. This is, presumably, the same Agnes Noseworthy who often calls open line shows to express her undying admiration for Our Dear Premier. She expounded at length about the trade which Ottawa is purported to have carried out with other countries, using fish quotas as a trading chip. And so on, in the same vein, for even longer; a nice nationalist-jingoist-crypto-separatist piece, complete with one of the favourite Eighth Floor leitmotifs – a reference to the number of years that have elapsed since March 31, 1949. The broadcast media in particular have an obligation to be fair, accurate, thorough, comprehensive and balanced in their presentation of information. The information is truthful, not distorted to justify a conclusion. Agnes Noseworthy is a member in good standing in the Congregation of Canada Is Out To Get Us. She has the zeal of the convert, even if she was probably born into it, and an irrepressible missionary impulse. Nothing will ever shake her political faith. And she has a good audience at the FishCast, where they are willing to air her proselytizing mythological message twice — unedited, unrebutted, unquestioned — over the course of three broadcast days. Principles? Policies? Who needs ‘em, when there’s a good ol’-fashioned Newfoundland nationalist myth to promulgate. Allocations for Trade Deals There is a widespread misbelief that Canada has repeatedly given foreign fishing countries allocations of Canadian quotas (or condoned overfishing) in return for trade deals for industries in other parts of the country. This is one of the most often repeated, unsubstantiated and untrue convictions regarding the government’s approach to the presence of foreign fleets. Two of the most repeated examples have been allocations to South Korea for a Hyundai car plant in Quebec and to Russia for purchase of Western wheat. A more recent one was the claim of allocations being given to Spain (in the 1980s) for landing rights in that country for CP Air. The review of foreign allocation policy and bilateral fisheries agreements conducted for the Panel concluded that no such deals were ever considered, let alone concluded. (Gough, 2005). Myths are easy. Truth is hard. Newfoundland myths are easier; Newfoundland truth, harder still. Getting that truth is what journalists used to do, back in quainter, gentler, times, even, from time to time, on the FishCast. Agnes Noseworthy is utterly convinced that these things happened. Art May, Dawn Russell, and Derrick Rowe, no slouches, have definitively stated the opposite conclusion. Agnes is unable to answer those questions, and unwilling to try; a common trait among all who have promoted the fish-for-X narrative over the past decade or so; in fact, a common trait among all purveyors of myth, Newfoundland-nationalist or otherwise. Getting to the truth of this matter, instead of parroting the myth; and answering those questions, or at very least trying to; these things should be the job of one of the two media outlets in the province devoted to matters fisheries-related. My goodness, but Bill Rowe likes to raise the spectre of separatism in his openers. And a comparison to Iceland and Ireland, too! How original! How curious that Comrade Rowe should make his explicitly separatist theme, the Eighth Floor their implicit one, and the Newfoundland Weekly Separatist its sui generis brant of separatism, so often, and in such similar terms: the endless glib and shallow comparisons to Iceland and Ireland (and Malta?! ), the references to "Atlantic Canada" as if Our Dear Province wasn't already part of it, and so on. And, boy, it would be hard to find a better example of a straw-man argument than Comrade Rowe's posit off the top of today's Two-Hour Daily Hate that our "island" will have to chose between becoming part of a larger, united, Atlantic Province of Canada, or separating from Canada altogether. What’s so sad about our rag-tag official Opposition being charged with holding Danny’s government accountable is that they’re no one to talk. No doubt the next four years will be difficult ones for the Liberal opposition — taking on a Goliath government of 44 MHAs — but imagine their pension payouts. An MHA’s pension is defined as 81.2 per cent of their salary, based on their three best income years. Given an average annual income over the next four years of $138,000, the three Liberal MHAs could eventually walk away from the legislature with a pension of $111,000 a year. Yet - not one word about the size of Danny Williams' cabinet; the cabinet that was slashed with such fanfare in 2003, and which is now pretty well as large as any Liberal cabinet that Our Dear Premier ever fustigated against. Or their pay and benefits. Or how the pay, benefit, and pension entitlements, government and opposition alike, came into being. Or about the blatant Green-bending, if not outright breaking, that's already going on. There's no "wow" involved, of course: this "journalism" is pretty well par for the course for The InDependent. Newfoundland and Labrador Hydro, Hydro-Quebec and the Iron Ore Company of Canada (IOC) announced an agreement Thursday to supply electricity to three towns in Quebec. Under the deal, NL Hydro and Hydro-Quebec assume ownership of the IOC generating facilities built and installed by the iron ore company at Menihek-Schefferville in 1954. The Menihek generating station is the only source of electricity for the isolated towns of Schefferville, Kawawachikamach and Matimekosh-lac-John. NL Hydro and Hydro-Quebec have entered into a 40-year power purchase agreement to supply electricity to the three towns. Hydro-Quebec will purchase a guaranteed minimum of 40-million kilowatt hours annually from NL Hydro. The Quebec utility will also reimburse NL Hydro for all operation, maintenance and refurbishment costs for the Labrador assets of the Menihek/Schefferville electrical system. "We have negotiated a good agreement for the sale of energy to Hydro-Quebec," said Jim Keating, vice-president of business development for NL Hydro. "We retain control over a provincial asset and resource and are adequately managing our financial and operating risks. The agreement also includes an annual escalation of price with the Consumer Price Index and the right to recall the power if required." We'll have to take Jim Keating's word for it, now, won't we? How many sooper sekrit energy deals has The Most Open And Transparent Government In The Galaxy, Danny Williams Government, "inked" so far this year? And heck, it's only the middle of November yet. First, certain media and political types started distingushing between "here" and "there". As in "We have a lot of talented artists here." "We have a lot of culture and history here." But as in, "It's going to be a cold one there tonight." Or, "Substance abuse is a real problem up there." And now, some of those same on-air personalities "here", and some of the politicians they interview, have taken to referring to the Maritimes as "Atlantic Canada". 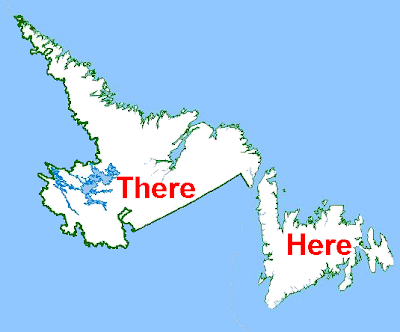 As if "Here", or "Here and There", weren't part of Atlantic Canada. Or, maybe, as if Here and There weren't even part of Canada at all. Behind closed cabinet and caucus-room doors, the beatings will continue until morale improves, but it's good to know that publicly "The Williams Government is committed to taking action against violence." Q: How do you want to be seen in the rest of the country? A: People misunderstand us, and it's easy to pigeonhole a crazy guy down in Newfoundland and Labrador who just shoots his mouth off all the time. Nothing is further from the truth. From my perspective, we just try to reach a deal. If we don't, we move onto something else. And I'm just saying to the guy, who happens to be the head of my country, "Give us a little support here." And he shuts me down completely. And the Hugo Chavez line starts to spin out. But I don't mind that. We're not Hugo Chavez around here. We don't own the television stations. I'm just interested in a bigger piece of the oil. A: People misunderstand us, and it's easy to pigeonhole a crazy guy down in Newfoundland and Labrador who just shoots his mouth off all the time. Over the past two years, the Williams Government has allocated $43.6 million in the areas of apprenticeship, science and technology, programming, training and infrastructure. For a whole host of reasons, Shaun Polczer’s interview with Danny Williams, in yesterday’s Calgary Herald, is a fascinating document. Q: You've been characterized in the press as Hugo Chavez of the North — how did that come about? A: That was spun by the PMO (Prime Minister's Office) because it served their purposes. I mean, he (Stephen Harper) came in here last year at a critical point in these negotiations — they had just fallen apart — and basically gave the province no support. Newfoundland and Labrador Premier Danny Williams will skip a meeting with his fellow premiers Wednesday to lobby Prime Minister Stephen Harper for the legal right to expropriate any oil field that remains undeveloped for too long, the Globe and Mail reports. Williams said he is looking to implement "fallow-field" legislation by the end of this year - or even by June - but that any such move will need to be done in conjunction with the federal government due to their joint regulation of the offshore industry. Such a law would allow the province to force the sale of any oil discovery that remained unexploited for 20 or 25 years, Williams told the Globe in Calgary. The longer deadline would embrace Exxon Mobil Corp.'s stake in the Hebron heavy-oil field, discovered between 1980 and 1981. The legislation has yet to be written, but its purpose in the province's increasingly heated showdown with the oil industry is clear: To force Exxon and the other Hebron partners to develop the project soon, and on Newfoundland's terms. Harper is travelling to Newfoundland to deliver a lunchtime speech Wednesday at the St. John's Board of Trade. Danny Williams might have to go it alone in his fight to acquire idle oilfields after Prime Minister Stephen Harper issued a decidedly cool response to the Newfoundland premier's proposal to secure offshore developments. Harper, in this port city Wednesday to promote his Accountability Act, said a dispute between the province and the partners in the stalled Hebron heavy oilfield should be resolved through negotiations, not by dragging the federal government into it. "We view this as a commercial dispute between two parties," he told reporters after a board of trade luncheon. Williams, who held a separate news conference immediately after Harper's, downplayed Ottawa's involvement in the scheme. He suggested it as a last resort that could hopefully be avoided if the parties get back to the table and agree on a resolution. "Basically, what we're saying here is that when all other avenues have been exhausted, if that is the only alternative, then we would be making a direct approach to the federal government," said Williams, who opted to miss the premiers' meeting in Montreal to stay home and meet with Harper. Premier Danny Williams is rejecting criticism in the national media that his hardline stand on the Hebron-Ben Nevis development is sending the wrong message to the business community. "I'm delighted we're getting that reaction from the national press," Williams told The Telegram in an interview Friday. Q Do you feel it's unfair to compare you to Hugo Chavez? A Well, I suppose I'd rather be compared to Hugo Boss! But if it's Hugo Chavez you're going to compare me to, yes, I think that's very unfair. From my understanding from President Chavez, he's looking for 60% ownership from the oil industry. We're nowhere close to that. We're less than 10% of that. And what was that “criticism in the national media” that so “delighted” Danny for the local audience, because it gave him some more Canadians to bash; and which he thought was “unfair” for the national audience, because it allowed him to cast himself, yet again, as the victim? Newfoundland, under the leadership of Hugo Williams, yesterday joined Russia and Venezuela at the forefront of grandstanding potentates facing off against the global oil industry. The official announcement from Chevron said it and three partners — Exxon, Petro-Canada and Norsk — had decided to "suspend negotiations" with the government of Newfoundland over the Hebron offshore oil project. Welcome to the Dannyverse, where things like facts, reality, and chronological order can be ignored wherever they are inconvenient, and where everyone who doesn’t already love Danny is out to get him. Somewhere in the recesses of Danny’s mind, he really does believe that the PMO, despite the notoriously acrimonious relationship they have had with the press, especially early in 2006, are not only able to tell journalists what to write, they are able to go back in time and do so. The Williams Government announced today it has renewed contracts with Labrador Marine Inc. for operation of marine vessels the Sir Robert Bond and the Northern Ranger. In addition to investing in ferry construction, in Budget 2007 the Williams Government injected $10.3 million for refits of government-owned ferry vessels and $5 million for maintenance and capital construction of terminals and wharfs. Since 2004, the Williams Government has increased funding to literacy programming by over $1.5 million for a total of approximately $24 million. The Standing Orders of the House of Assembly used to be available on the House of Assembly's website. It was not a little disturbing, despite the overall good-news nature of the call, to hear "Paddy" from the Burin Peninsula calling into VOCM tonight about the new dialysis unit for the area. Disturbing, because Paddy thanked the donors who contributed towards the unit, including "Premier Danny Williams". If, on the other hand, Paddy was referring to regular government funding that went towards the satellite dialysis units, then it's disturbing that the general public is now confusing public program spending and "donations", and that the roles of government and charity have become concatenated in the popular mindset. That's not just wrong, it's dangerous. Either way, something is rotten in public discourse, public expecations, and public life. And for some sneaky reason, this corner can't help but wonder how much worse things are going to get, before they even look like they are going to get better. "The more fuss they make," sputters Comrade Rowe of newspapermen, "the better they like it… Anybody can stir up a controversy with a stupid, idiotic, remark, that’s not hard to do." Bill Rowe, of all people, would know. Aren't those things in his job description? "Civil war seeds were quietly planted in Canada’s front yard this week," military strategist Ryan Cleary scribbles this week in his organ, "an impending battle that could threaten the nation’s fabric." Powerful forces are lining up across Canada in the fight to control the eventual flow of energy from Labrador. Clean hydro power is more precious than gold in today’s environment. Some wars are unavoidable. Some wars are welcome. At last! We now know what we are fighting for! Norman Webster said something stupid about Newfoundland. Therefore, says Comrade Rowe, on account of the comments by this "stupid, ignorant, moron", we should separate from Canada. Hey — on a totally unrelated note, didn't some guy or another, a stupid, ignorant, moron perhaps, once call Labrador, which forms 72% of the province, "minute"? Lewis, do you ever hear the, did anyone ever tell you that you whine an awful lot? That there's an awful lot of whining going on when it comes to a situation in Labrador? I mean, you're making progress in Labrador as a result of your efforts and the efforts of political figures and municipal leaders and town people generally. I mean, you are making progress are you, or are you not? Newfoundland and Labrador has only seven seats in the House of Commons. Therefore, says Comrade Rowe, we should separate from Canada. We should become, as he says as Our Dear Premier Says, "masters of our own house." Oh — on a totally unrelated note, Labrador has less than seven seats in the House of Assembly. As you were. Back to the Two-Hour Daily Hate. The saturated-colour bars are party leaders who were elected Premier in their own right. The pale-coloured bars are party leaders who stayed in opposition, at least as leader. The pattern is pretty clear: opposition parties eat their leaders alive, for decades at a stretch. The question for the Dannystan Liberal Party tonight is: Is John Efford or Danny Dumaresque the one to break that historical pattern? OK, it actually spells "nouvelles". It's the jingle that introduces the hourly newscasts on the airwaves of Radio-Canada. CBC used to have one, too. A good old standard, one that just spelled "news". It had the air of authority about it. Just like Radio-Canada's. And they changed it again. And again. And then they changed it to this god-awful Associated-Press-Reports-That-President-Kennedy-Has-Died dirge. And then a slighly less dirgeful — but just — version of The Dirge. And there were variations on The Dirge. And on the TV, for a while they made the theme for the hourly newscasts on CBCNW indistinguishable from the opening of The National. Meanwhile, Radio-Canada has stuck with the same, familiar number for years. Stateside, so has ABC's evening news half-hour program, the one that Peter Jennings anchored. It, too, has the well-worn imprimatur of authority about it. Fixing things that aren't broken, then fixing them again by breaking them more: not good. The entire wing of the National Broadcast Centre that is responsible for deciding that existing themes are no longer any good, then replacing them, then re-replacing them — there must be hundreds of people working in that division by now — should look up "New Coke". While they are doing that, they should listen to the Radio-Canada jingle. It's catchy. How many more times is VOCM going to give free, uncritical, unquestioning air time to designated climate-change deniers Tim Ball, and, especially, to "Tom" who calls in from Ontario fairly regularly? Over the weekend, the Globe and Mail ran a feature – again, this time with video – on the trials and tribulations of the coastal Labrador community of Black Tickle. Perhaps Locke can point out some other examples of this “stereotypical” “cliche shallow reporting” he decries. The Globe and Mail, in particular, has, since the very early 1970s, provided some of the best in-depth writing on coastal Labrador, often better than anything produced by any local outlet in the province of which coastal Labrador is a part. [Ashley M.]: I just watched the video on Black Tickle twice. I think that it is absoulty amazing. Black Tickle is a beautiful place, with Beautiful People, all they need is a little help from the government to build a economy so that they won't have to leave home.. is that really to much to ask? If Black Tickle had water & sewer, and the road put through I know that the place will grow again. I love Black Tickle, and I know that some other people have got different views on the place, and thats their choice, but ask yourself... will you be ready to leave home when you just have too? you might say you can, but wait tell that time comes.. This is why you still have people there, it's there home, it's where they grew up and where they started their own families. When you go to Black Tickle, you will never see someone without a smile, everyone is as happy as they can be, just imagine how they would be if they had water & sewer, and a road put through. [Ralph]: Thank You WJM for that video Clip of Black Tickle, sad to see how things are and that road may not help boost the economy for Black Tickle directly (or indirectly). [Laura Keefe]: Comments: I just wanted to say THANK YOU to Ashley M for those beautiful words that she wrote about Black Tickle.....I couldn't have written them better myself. I was born and raised here in Black Tickle and I have seen Black Tickle at its best when the cod was going mad and I am still here now when things are rough and people wonder where the next break will come from. We do need help here, we need help from the Government to step in and say "THE PEOPLE OF BLACK TICKLE HAVE BEEN LIVING IN THE THIRD WORLD FOR FAR TOO LONG AND IT'S TIME TO MAKE THEM AN ECONOMICAL AND SOCIAL EQUAL TO ALL OTHER"! Makes tears come to my eyes when I think of all the people who have moved away and makes me proper cry when I thinks of the prospect that maybe someday I may have to leave too. My whole heart and soul is in this place and I can't even imagine what it would be like to wake in a strange town knowning that I could never go back or ever feel at home again. I know that a lot of people who live in Cartwright have ties to this place as well, like in Batteau, Spotted and Domino and I just wish for some miracle to happen to bring back the prosperiety that once was so second nature to this place. We need a loud and powerful voice to make the government see that we deserve what everyone else already has. I just wanted to Thank Ashley M once again for sharing those kind words. [mac]: It is amazing that a news media on Toronto would take the time to acknowledge Black Tickle when you have to look long and hard to find mention of our Labrador communities in the Media in this province. [Lillian Dyson]: just wanted to comment on the globe and mail about Black Tickle.................I really enjoyed watching the video clip and its contents by Livenda Turnbull, every thing in it was so true..... hats off to Livenda for genuinely speaking on behalf of the residence of Black Tickle, Black Tickle is slowly fading away yes but its high time the government stepped in and help the community to be a better place, but speaking on deaf ears, it probably will accomplish nothing, and once again Black Tickle will be left in the dark again, maybe Yvonne Jones will help as she is the only one left now in the government to do so, and we are only standing on one leg now as the government went PC, but you never know we are not dead and the community isn't either, don't give up it's when we are at our wits end that we receive help. Thank you for showing this Dean, it means so much to me. [Billie]: I really commend Livenda Keefe for her comments of Black Tickle on the video in the Globe & Mail. Not one condemnation of the Globe’s reporting as “stereotypical”, “cliche”, or “shallow”. Instead of condemning the Globe and Mail for supposed failures in its reporting – failures that the people being written and video-journalled about don’t seem to be nearly as concerned about as Mr. Locke is – perhaps he could criticize those in government who, decades after the Globe and Mail first started writing about Black Tickle and other coastal Labrador communities, have done nothing. He could denounce the provincial government for its cynical dealings with Black Tickle and several other Labrador communities, back in the 1970s, when the “Native Agreement” monies first started to flow. The province designated Black Tickle, and other places, as “native” just long enough to inflate the “native” headcount in Labrador, and thereby justify a larger cheque from the federal government – and then promptly turned around and dropped the designation as soon as it became time to spend the cash. He could criticize the one glaring factual error in the Globe’s report, the implication that 3,000 people once lived in Black Tickle. They didn’t, even if 3,000 people, for a couple of years, descended on Black Tickle as itinerant fishermen during the last, gasping, glut of the Labrador fishery in the late 1980s. Not only from outside Black Tickle, but from outside Labrador. Greg Locke gets three guesses as to where the overwhelming majority of them came from. It’s so easy to confute traducers, especially Tronno Traducers. It’s not nearly as easy, especially not for the Greg Lockes of Our Dear, Secret, Nation, to ask why it’s the Globe and Mail (Saturday Night, Canadian Press), and not the St. John’s Telegram, producing these features. Nor to ask why their coverage has met with generally positive reaction on the part of the covered. Nor to ask why, after nearly forty years, after the rise and fall and rise and fall of the (New) Labrador Party, and a Royal Commission on Labrador, and the Blame Canada Commission, the Globe and Mail’s early-1970s coverage of social and economic conditions in Labrador, or Barbara Yaffe’s in the early 1980s, or the pieces from the early 1990s, are as current as its 2007 version of the same, old, story. And now let's go back to listening to Townies on the radio complaining about how the Outer Ring Road needs to be re-paved. More like Lord However-You-Transcribe-That-Pathetically-Bitter-Slightly-Constipated-Sound-That's-Halfway-Between-A-Sneer-And-A-Whine-That-Ooozes-Out-Of-Bill-Rowe's-Mouth-Right-Before-He-Says-"Canada"-Or-"Ottawa"-Or-"mainland"-Or-"Confederation"-Or-"federal"-Or-"Globe and Mail". The Canadian Council of Bureaucrats was holding its big annual convention in Winnipeg. After a long day of seminars and presentations with titles like “ACRONYM: Acronym Creation for Re-Organizing Neatly Your Ministry” and “Intermediary Gobbledygook: The uses and further uses of run-on sentences and polysyllables”, the bureaucrats, from across Canada, from every jurisdiction, were ready to let their hair down. So, in a dimly-lit corner of Bureaucrat Bar, a federal and a Newfoundland and Labrador provincial ADM commiserated over libations. They talked about dealing with their respective unions, dealing with their respective publics, and creative ways of blowing off ATIP requests. And they compared the political cultures within their respective civil services. “Oh no,” the provincial official protested. “It’s not like that at all, not at all. First, Our Dear Premier said the benefits of Our Dear Fibre Optic Cable were "not possible to quantify." Now his federal confrère from Canada, the country with which We are still at war, informs us that $2-million "investment" in the cranberry industry will bring "endless job opportunities." "Do you miss politics? ", Bill Rowe opened his banter yesterday with Len Simms, CEO of Newfoundland and Labrador Housing Corporation — sorry, NewfoundlandLabrador Housing Corporation, as, in a sycophantic fit, it's taken to calling itself. It's only been a month since he's been out of it. Chapter XVII of Machiavelli's The Prince is titled, "Concerning Cruelty And Clemency, And Whether It Is Better To Be Loved Than Feared". My boss can vote for who he wishes. He can mark his X where he wishes to mark it. From my perspective, I have a job to do. I'm elected by the people of St. John's Centre. I'm in cabinet representing the people of the province of Newfoundland and Labrador. I have a job to do, and I'm going to do that to the best of my ability. Skinner obtained his cabinet post in no small part owing to his willingness to act as a human shield, and designated attack poodle, for Our Dear Premier, especially on the VOCM airwaves. Which brings us to Danny Williams, who has, very obviously, made it very clear to Minister Skinner that keeping the job that he has to do will also depend on making a call to VOCM. Danny desperately wants to be loved. He seems to think the route to that love is to be feared — last winter's by-elections proved that long before this fall's general election ever did. But neither love nor fear are sufficient any more, not in a political culture where Dear Premier has escalated all the way to humiliation of his own cabinet. And of course, if it serves pour encourager les autres, all the better. The trend towards personifying the government in Him, quantified. 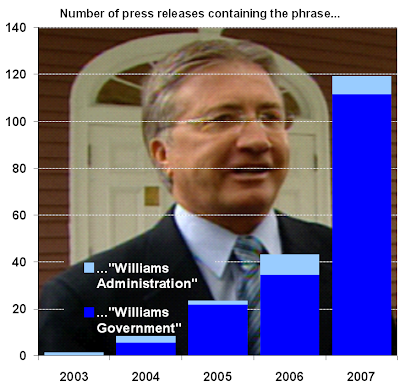 This chart shows the total number of provincial government press releases, by year, as unearthed by Google, which contain the phrase "Williams government" or "Williams administration". False positives are excluded from the count. And before anyone asks — there do not seem to have been any instances of the Wells, Tobin, or Grimes government, in the internet era, having referred to themselves, while in office, as "Wells government", "Tobin administration", etc. Or is it Government of Williams and Williams? Or maybe the Conjunctionless Government of WilliamsWilliams? There is, of course, no political Cult of Personality in Dannystan. Our Dear Political Scientist says so. To date, the Williams Government has invested approximately $76 million in construction of the Trans Labrador Highway. More senior couples in Newfoundland and Labrador are benefiting from the seniors’ benefit thanks to changes brought forward by the Williams Government in Budget 2007. The initiative is a six-year, $9.2 million commitment by the Williams Government to reduce violence in Newfoundland and Labrador. Both are important aspects of the Poverty Reduction Strategy developed by the Williams Government. 1) How does the "Williams Government" and its "approximately $76 million" stack up to, say, the Tobin Government or the Grimes Government? How much did the provincial government spend on the TLH in the four-ish years that Tobin was Premier, or the three-ish that Grimes was? Because, y'know, if you're going to personallisimize every bit of government spending, there's no reason to start your reckoning in 2003, being Year One of Our Dan. 2) Of that approximately $76-million, how much — and let's not approximate, here — how much, to the nearest hundred-thousand, came from the Labrador Transportation Initiative Fund which, until Our Dear Premier, and His Dear Succession of Transport Ministers got their hands on it, the recognized as having come from the coffers of the federal government? In other words, how much provincial money, from provincial revenue sources, not federal transfers, has Williams Government put into the Trans-Labrador Highway? Visions to Actions – A Roadmap to 2020 marks an important step in the Provincial Government’s strategy to build strong, sustainable rural communities. The conference will provide the forum for citizens, through the regional and provincial councils, with the opportunity to collaborate with the key decision-makers to help build a roadmap to enhance sustainability of the province’s rural communities. "This government is committed to working with citizens to build strong and sustainable rural regions," said the Honourable Danny Williams, Premier of Newfoundland and Labrador. "Engaging citizens to create a shared vision and a clear pathway to regional sustainability is a key step in achieving our goal. I am confident that this forum will enable us to identify the appropriate actions required to address rural challenges and maximize opportunities." The conference, scheduled for November 7-9 in Gander, will expand upon the Rural Secretariat’s Dialogue Days previously held in Port Blandford in 2004, Marble Mountain in 2005, and Rocky Harbour in 2006. Participants will include 14 Cabinet mnisters, three MHAs, all regional and provincial council members of the Rural Secretariat, senior public officials, community stakeholders, and youth from across the province. Discussion will include, but not limited to, how best to attract, retain, and engage youth, along with economic, labour market, social and demographic issues facing rural Newfoundland and Labrador. "Strong"? Where, oh where, have we heard that word, ad nauseam, lately? Are "we" perhaps going to collaborate with the key decision-makers to help build a roadmap to enhance "proud" and "determined" communities, too? It's hard to tell whether this press release is a sorrier comment on the state of education, or on the state of provincial government incompetence generally.